BACKTOFRANKBLACK.COM: Free podcast! Millennium Group Sessions #6 - Keegan Connor Tracey Interviewed! Free podcast! Millennium Group Sessions #6 - Keegan Connor Tracey Interviewed! 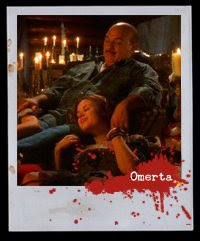 In the sixth episode in the Millennium Group Sessions series, Troy and Jim speak to Omerta guest star Keegan Connor Tracey (Battlestar Galactica, Final Destination, Supernatural) and take a deeper look at Omerta. Expect the usual news, updates and informal chat in the first of the two part Omerta special that concludes next week with an interview with actor Jon Polito. 4 Responses to "Free podcast! Millennium Group Sessions #6 - Keegan Connor Tracey Interviewed!" I listened to it this night at work when all was quiet. And again, a very enjoyable listen. Shorter than most, but still got in a lot of questions and you managed to keep a light fun atmosphere that only Troy and James can! And thanks for the feedback on my first MM music video for the Pilot. I've got a nasty Troy and James habit now and I resorted to listening to episode number 25 of spooktalkular and I've almost finished the "interview". And it's so funny, and James, it's okay to ramble on....especially when it's funny. EXACTLY! Another great interview. She is pretty AND has talent. I really enjoyed the interview. Keep up the good work. Loved the podcast and interview with Keegan, had forgotten she was in 4400! HUGE, HUGE fan of 4400 and even bigger fan of BSG! :)She sounds like such a delight! Love her quirky characters! Rambling is just fine by me! We always have such a fun time chatting with James and Troy, they are very sweet and funny and just really good down to earth guys! We as fans are very lucky to have such great guys with big hearts(yes, you too James)haha running such an awesome campaign. Managed to catch up with Keegan's podcast interview last night! It was wonderful to hear about how Keegan got into acting and her desire for non-traditional, perhaps quirky roles that challenge and demand something new that hasn't been done before. Its a shame to hear that your signing didn't make it into the episodes, and thank you for the trivia about the original director sadly being taken ill. Paul Shapiro certainly did a marvellous job in taking over the reins at such short notice. The talent of Millennium's cast and crew knew no boundaries! Sorry but I didn't recognise you in Final Destination 2 from your role in Millennium, I'm sorry, but nonetheless it was another great role and terrific death scene! Thanks again Keegan and the BackToFrankBlack team for another wonderful interview!